She told me how helpful her support group had been and how they continued to meet informally after the group ended. I took her advice and called the BCRC. I spoke to Elaine, my Patient Navigator, for about an hour. I remember sitting out on my back porch, asking questions, sharing my story, and feeling completely understood and supported. Elaine invited me to join the Coping With Breast Cancer course that she was facilitating so I could continue to feel that support. 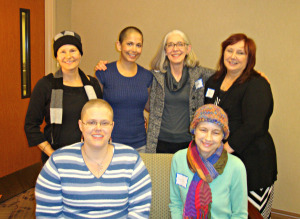 The group turned out to be eight women – all of us with a different type of breast cancer and a different treatment. Some had mastectomies, some chemo, some both. We were also in different places in our journeys but the common denominator – breast cancer – made us a tight group from the start. We laughed together, cried together, and learned from each other, as well as from our Patient Navigator support group facilitator, Elaine and Marjorie, who were able to share their experiences living with breast cancer both during and after treatment. And what has happened since our group ended at the end of February? Well, I see one of my new friends at chemo every Thursday. We have asked them to put us together so we can continue to support each other. We’re getting to know each other’s families and friends. She will be there for my last chemo and I will be there celebrating hers. And, this I know – our friendship will not end with the chemo. And, just yesterday, one of the members from our group sent an email saying she was feeling blue. Immediately, another one of our members took flowers, groceries, and cheerful videos to her home. And there were emails and calls to her from the rest of us. She is not alone. She does not have to go through this alone. We – her support group – are there for her and for each other. I was also able to give her the name of a woman in our group who has gone through a very similar breast cancer journey. And let me tell you, this particular woman has the most calming voice, and as a writer, she says the most beautiful things. Whenever she spoke in group, I would feel peace washing over me. My friend’s mother will be in good hands. If I were queen of the world – no one would have breast cancer. No one would have to hear those words. But, unfortunately breast cancer is a reality that affects way too many women. The BCRC ensures that no one has to go through the experience alone. If you are recently diagnosed with breast cancer, we would like to extend a special invitation to you. Our Coping With Breast Cancer course is designed to help women get in touch with their cancer experience. It provides coping skills and a sense of community and connection. This group aims to decrease the physical and mental stress that can arise during the course of treatment, while also providing a safe place to recognize and express fears and concerns. Understanding the role of the caregiver is also emphasized. Our circle is for women diagnosed (up to one year) with any stage and in any treatment phase of breast cancer. This is a closed group and we request that a commitment be made to attend most meetings during this time. Pre-registration is necessary, please contact support@bcrc.org or call 512.524.2560.